It is impossible to talk about sustainability without involving campaigning organizations or NGOs. Thanks to sustained levels of campaigning, especially by groups in the environmental arena, there is now hardly a major company operating today that is not taking seriously the notion of reducing its environmental impact and trying to achieve more ethical production systems. From the international NGO networks such as Greenpeace and Friends of the Earth to national and local groups such as Générations-Futures in France, NGOs have played a major part in establishing ‘sustainability’ as a defining characteristic of premium food retailers and brands. Campaigning on sustainability has grown several-fold in volume over the past 15 years (see Chart 1). Since the beginning of this decade it has rarely fallen below one-third of the level of NGO campaigning. For the environmental sustainability movement, this is hardly surprisingly. 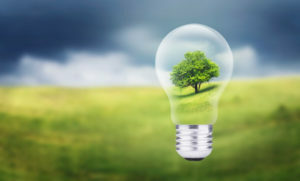 ‘Sustainable’ has become the phrase of choice, substituting for ‘environmentally friendly’, an idea many green campaigners have been espousing since the early 1970s. Indeed, this was the idea, expanded in seminal texts such as E F Schumacher’s Small is beautiful, that helped inspire some of today’s greatest environmental brands and campaigning groups, most notably, Friends of the Earth. Notwithstanding its ‘small is beautiful’ origins, ‘sustainability’ is now embedded in big business. The world’s largest food companies such as Unilever, Nestlé and General Mills are showing the world how to reduce the environmental impact of their supply chains. Meanwhile, the term ‘sustainable’ – despite, or maybe because of the vagueness of the term – has become a must-have word for virtually every company report, and on any product aimed at discerning middle-class consumers. At the producer level too, growers and buyers have been collaborating to develop practical definitions of sustainable production and to implement practices and monitor progress. One example is the Field to Market initiative in the United States, with the stated goal “to meet the challenge of producing enough food, fiber and fuel for a rapidly growing population while conserving natural resources and improving the ability of future generations to meet their own needs.” The program has developed measurement tools and resources for growers and the supply chain that track and create opportunities for continuous improvement at the farm level. Its governance includes representatives from grower organizations, conservation groups, agribusiness and retail/manufacturing. Recently, a new driver of consumer interest in sustainability has emerged: ‘ethical consumption’. Ethical consumption looks beyond the environmental impact of a product to include its wider human and moral aspects, from the way farmers and producers treat their suppliers, employees and contractors, to the welfare of their livestock and the humaneness of animal transport and slaughtering. This has been an important factor which has influenced the improved animal welfare standards used by farming groups and sought by major meat purchasers such as retailers and restaurant chains. Ethical consumption introduces a human and moral element into what can otherwise be somewhat abstract issues espoused by environmentalists. Concerns such as poverty wages, slave labor and even animal welfare also tend to be much more compelling for consumers than soil depletion or optimizing fish stocks. NGOs have been investing heavily in promoting interest in ethical consumption to harness consumer demand and force the hands of producers to raise standards. 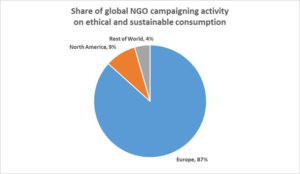 As chart 1 shows, by the end of 2015 more than ten percent of global NGO campaigning involved promoting ethical consumption. This was twice as much as just two years earlier. 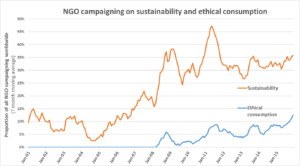 One reason for the rapid rise in NGO campaigning on ethical consumption is the large number of NGOs involved. Because ethical consumption links together a wide range of issues and concerns, a much broader coalition of NGOs is active than with simply environmental concerns. Human rights campaigners, development experts and animal rights activists are all very much involved in developing standards and lobbying consumers and politicians to change their buying habits. Europe so far appears to be a more receptive market for ethical consumption than North America, if the amount of campaigning in these regions is an indicator. As chart 2 shows, 87% of all European food-related activism in 2014-2015 promoted ethical and sustainable consumption, compared to only 9% of activism in North America. (There, many NGOs prefer to focus on safety and “anxiety issues” such as pesticide residues and GMOs.) NGOs are most active on ethical and sustainable consumption issues in the northern Europe: Germany, the Netherlands, Sweden, Norway and the United Kingdom. The rise in ethical consumerism campaigns does not necessarily mean, however, that consumer behavior has yet changed on a large scale. Marketers have long known that consumers are more likely to voice support for ethical positions when asked by pollsters (a form of value signaling), than use them to make choices in the store, especially when there is a significant price difference. NGOs in the European Union (EU) have been focusing significant efforts to lobby public purchasers, such as local authorities and municipalities, in the hope of ‘jump starting’ a general movement towards more ethical consumerism. In many countries, public authorities and the elected officials that control them, are being lobbied to impose standards for purchasing and acceptable contractors which go well beyond traditional ‘best value for money’, let alone lowest bid principles. In public food purchasing by educational establishments, municipal offices and hospitals for example, NGOs working with specialist producer lobbies such as organic standards bodies would like officials to mandate local or organic produce and to apply preferred environmental standards. For example, standards developed by organizations such as the Forest Stewardship Council (FSC) for wood and paper supplies and the Roundtable on Sustainable Palm Oil (RSPO) for palm oil are often promoted in such lobbying campaigns. These standards are not mere greenwashing. Just this month, several major food companies stopped buying palm oil from one of Malaysia’s largest suppliers because RSPO had suspended its certification over environmental concerns. Campaigners rightly argue that these rules force officials to ‘better serve’ their communities by favoring local suppliers or at least favoring suppliers with ‘higher’ production standards. Food manufacturers and processors also are on the receiving end of campaigns to adopt NGO-mandated standards in their ingredient purchases. Typically, such campaigns are aimed at the largest firms, these being judged to have most to lose in any ‘fight’ with a campaigning group. In recent years, a wide range of ingredients has come under NGO scrutiny, from nuts and sugar to tomatoes, soya and eggs. Food retailers, meanwhile, are placed under intense pressure to ‘destock’ products or refuse to accept new ones that do not meet the NGOs’ ethical and environmental standards. Campaigners call it ‘choice editing’: rather than trying to persuade millions of consumers not to buy, for example, cheap battery hen eggs, it is easier to have a few food retail chains agree to stop selling them so these consumers never have the option. Another example is the way in which anti-biotech campaigners in the U.S. have persuaded several national food retailers not to sell Aqua Bounty’s genetically modified salmon when it is eventually commercialized. An environmental scientist’s definition of ‘sustainability’ is an ecology that is diverse and productive indefinitely. A sustainable development expert will include a host of other goals, from ensuring universal primary school education to combating HIV/AIDS in the production country. A business manager will use sustainable simply to mean an operation that will reliably generate profits. Even NGOs are not of one mind. Some environmental NGOs exclude modern food production methods such as genetic modification and the use of synthetic pesticides and fertilizers, while others, notably WWF in the U.S., are neutral on GMOs and more concerned with reducing the environmental impact of pesticides than outlawing them altogether. Without doubt, out of all these views, those of the NGOs, as generally the more trusted source for consumers, are setting the pace. Food retailers and processors need to balance the pressures of campaigners with the complexity of a practical sustainability definition, the unique natures of the broad array of commodities, and most important, customer expectations, including cost. The challenge for food producers is to determine and meet shared and reasonable definitions of sustainability and ethical consumerism that both meets consumer and distributer and NGO expectations and allows them to continue to operate profitably. Robert Blood is the founder and managing director of SIGWATCH, the world’s leading research and strategy consultancy on NGOs and campaigning groups. Robert Blood is a highly regarded trainer on predicting and managing issues campaigns. He is a visiting lecturer at several UK universities and is a member of the Editorial Board of the Journal of Communications Management. The above work, “NGOs, sustainability and the rise of ethical consumerism”, was commissioned by the U.S. Sustainability Alliance and represents the views of the author only. One’s view of “sustainable food production” may also depend in part, upon where one lives. The U.S. Sustainability Alliance (USSA) comprising American farmers, fishermen and foresters was formed by recognizing that sustainability is not an arbitrary threshold, but rather a commitment to continuous improvement and innovation. A goal of the Alliance is to share U.S. stewardship and sustainability practices with colleagues and counterparts for greater mutual understanding of resource management practices. Read more about environmental sustainability.